Great Britain’s role in shaping the history of the automobile cannot be overestimated. The British motor industry has been responsible for many of the world’s landmark car designs, and its famous names – including Jaguar, Bentley, AC, Rolls-Royce, Aston Martin, MG and Lotus – are inextricably linked with some of the most recognized and coveted models ever made. Now reissued in hardback format, this beautifully presented book gathers together more than 50 of the most significant and seductive British cars designed between 1907 and the present day, from the Roll-Royce Silver Ghost to the Jaguar XK180. 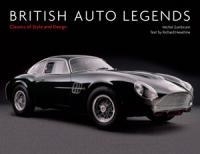 With an introduction describing the often tortuous story of British motoring and its great marques, a succinct description of each car’s history, design and performance, and unparalleled images by one of the world’s foremost car photographers, this book is an authoritative tribute to the nation that launched the sports car. Richard Heseltine is a journalist and author specializing in contemporary sports and exotic cars. His work has appeared in such publications as Classic & Sports Car, Motor Sport, Octane, Autocar and The Guardian. Michel Zumbrunn is one of the world's most celebrated car photographers. For more than 40 years his work has been featured in car magazines worldwide.